Ran SINGH was one of the many hawkers who criss-crossed Western Victoria in the 1800s and early 1900s. This photograph of Ran SINGH and a young Richard NEATE is thanks to the NEATE family was taken on one of the hawker's visits to the NEATE home at the Henty Railway Station, between Merino and Sandford, in the 1920s. COLERAINE, Tuesday.-Within a short distance of the main street of Coleraine, Ran Singh, aged about 75 years, an Indian hawker, was burned to death in his cart to-night. He had been hawking in the district for many years. 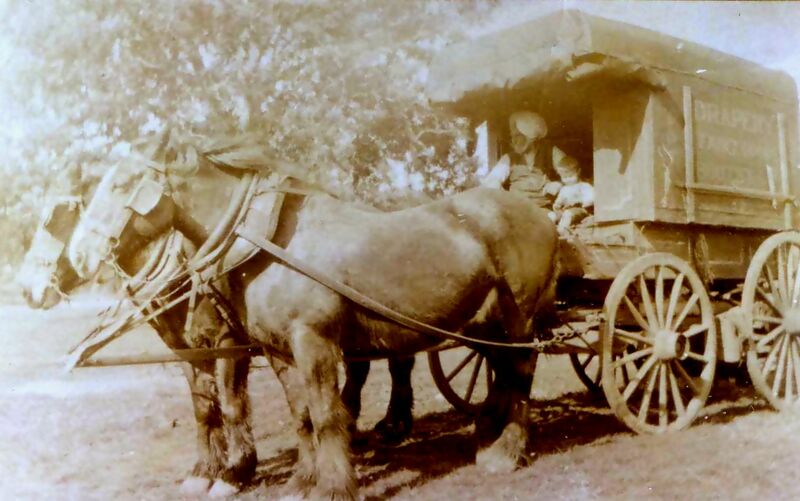 Having drawn his covered cart to the side of the road, Ran Singh made his camp in McLeod street, which is next to the main street. Shortly after 10 p.m. a resident saw flames coming from the cart. With several other men he rushed to it, and pulled it across the road, and water was thrown over it. The flames were scarcely checked, however, and the cart had been destroyed when the fire brigade arrived. Ran Singh's body was found in the ruins. NEATE family, Henty Railway Station, 1920s. Percival Jaques NEATE 1878-1932 was born in New Zealand, son of Charles John Humphries NEATE and Eveline JAQUES. The family emigrated to Victoria where he married Ethel Margaret MORGAN 1880-1967, from Bendigo, in 1907 and they had a family of 8 children from 1908-1924. Little Richard NEATE in the above photograph was the 7th of their 8 children. Many of the NEATE children attended the local Henty State School. Percival NEATE and his wife Ethel worked for the Victorian Railways and were stationed at Henty Railway Station, located close to "Merino Downs" homestead, for about seven years in the 1920s. Percival was a rail ganger maintaining the Branxholme to Casterton line and his wife Ethel was the Station Mistress at Henty Railway Station.